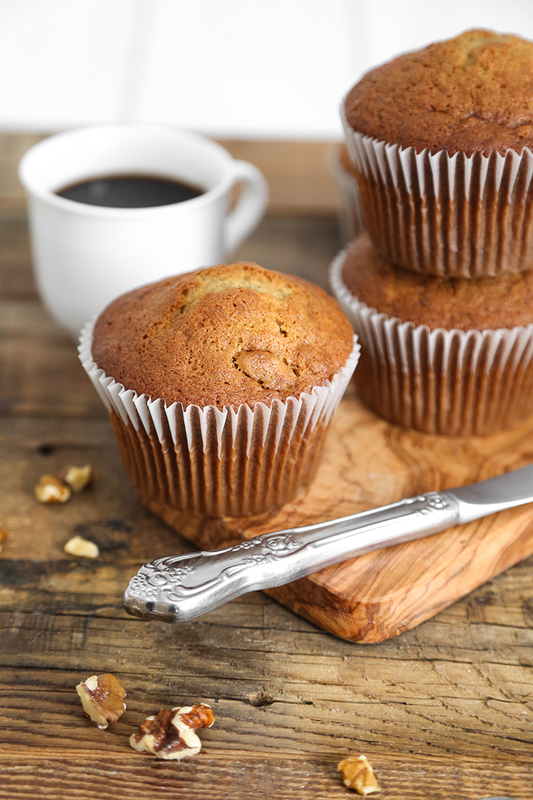 These modest muffins aren't winning any beauty contests, but boy, are they ever delicious! 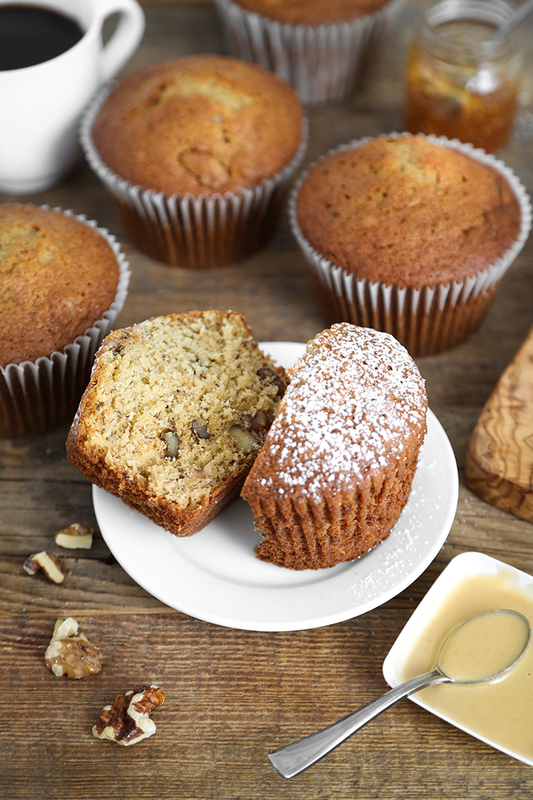 This is the one of the best banana nut muffin recipes I've ever tried. In fact, I've been making these almost weekly for the past six months. It takes many batches of baking for me to bestow the word favorite on a recipe, but this one has earned the title. They make an excellent breakfast with salted butter and coffee, and often one of these muffins will sustain me for most of the day. This recipe makes six big muffins (this size) but I always, always double the recipe to make twelve. They've become quite popular with friends and family, and they always seem eager to enjoy one straight from the oven. My best tip? I recommend using bananas that are at least as brown as the one in the picture above, for best results. Often my muffin-making bananas are completely brown. I have one variation on this recipe using tahini, which I'll explain in the recipe. The original version is my favorite, but tahini is so delicious with the flavor of banana. Tahini lovers will want to try this option. This is such an easy, unfussy recipe. And so satisfying! I hope you'll love it as much as I do. Preheat the oven to 350°F. Line a jumbo muffin tin with paper liners (tin cavities should be about 3.5 x 2.5 x 3 inches each). In the bowl of an electric mixer, combine the butter and sugar. Mix on medium speed until well-incorporated. Add the eggs and mashed bananas. Mix again until combined. In a separate bowl, whisk together the flour, baking soda and salt. Add the flour mixture to the banana mixture. Mix briefly until just combined, add the vanilla. Mix again briefly. Use a rubber spatula to scrape down the bowl and mix in any pockets of dry ingredients that may remain. Fold in the walnuts. 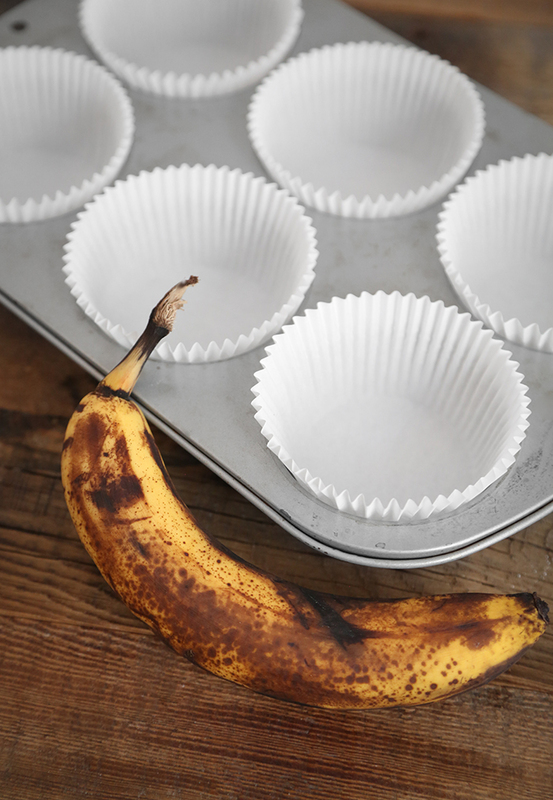 Divide the batter evenly between the six muffin cups. Bake for 30-35 minutes, or until a toothpick tester inserted in the centers of the muffins comes out clean, or with a few moist crumbs attached. Transfer to wire racks and let cool slightly. Serve warm with salted butter. Loaf option: Pour batter into a greased and floured loaf pan, approximately 8x4-inches. Bake for 50-55 minutes. Tahini option: Make batter and remove half to a bowl. Add 1 cup of tahini and 1 egg to the bowl. Mix well. Add tahini batter to remaining banana batter and swirl together lightly (do not thoroughly mix; just marble together 2-3 times). Proceed with adding nuts and baking. I would like to know what’s in the bowl that is beside the muffin? Hi! If it's the bottom picture you're speaking of, that's tahini which is sesame paste. There's a Tahini variation in the recipe text. Muffins straight from the oven....can’t beat it! These are terrific muffins. I have found that using toasted pecans works really well too! Delicious! I made it with tahini. This sesamy hint was surprising but so good!